We did it! we’re in North Carolina now. The final week in California was definitely the hardest, but no major problems, so that’s good. Took Edie to her one year doctor appointment. Took Toro to the vet to get a health certificate. Our airline (United) officially requires them even though no one ever asks to see it. Took electronics to Green Citizen, a local electronics recycling center. They seem like the best bet for responsible electronics recycling around here. Took batteries and antifreeze to the San Mateo County Household Hazardous Waste Disposal site. Sold the Corolla with Peddle for $780. It was fine. Mostly easy, though the tow driver who picked it up arrived 3 hours 15 minutes after the end of his 10am-11am window with almost no communication at all (he called at 1:55pm and said he’d be here at 2:15pm). I assume he’s just some local tow truck driver and he got other calls that morning that were more urgent or paid better, so he took those first. I think donating it would have been about the same amount of effort and probably would have given us a larger tax deduction compared to the amount Peddle paid, but I imagine we’ll take the standard deduction again when filing our taxes next year since it’s so high now, so we wouldn’t benefit from the donation. Picked up a rental car. Sold a ton of stuff on Craigslist. Our TV for $50 (47 inch LG 47LE5400 from 2010), some decent-but-outdated computer parts from 2014 for $20 (Intel Core i7-4770S, 32 GB DDR3 memory, Asus Z87M-PLUS motherboard, and 430W Antec power supply), iRobot Roomba 650 Vacuum for $20, a decent pair of KEF C55 speakers from the late 80s for $30, a small bedside table, a Pack ‘n Play. Paid the second installment of our California property tax. Posted our No Parking signs outside. This process is super basic. Basically we went to city hall and told them we wanted to reserve space on the street for our moving truck. We told them the street name, date, and time, but it wasn’t clear if they did anything with that information. 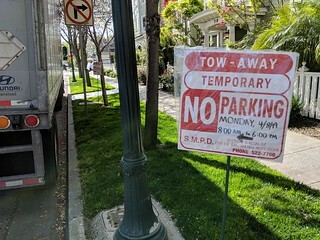 They sold us three blank paperboard No Parking signs for $3 each. We wrote in the date and time ourselves and were responsible for putting them up. We bought some long poles from Home Depot and taped the signs to the polls. It felt like we could have written pretty much anything on the signs. We felt weird. Packed a ton of boxes. Watched both kids all week because daycare was closed. Moving day! The moving trailer was dropped off. The movers arrived and loaded everything while Emily and I watched the kids and Toro, took furniture apart, and finished packing/throwing things away. It was a hard day. We also handed off all our keys to our realtor. We stayed in a hotel that night then flew from SFO to RDU the next day. My name is Mark Doliner. I’m a computer software engineer looking for work around North Carolina, USA. I worked in the San Francisco Bay area for 12 years before moving back East in 2019. My email address is mark@kingant.net.